While seated In A Chair A person very often desires to lay the head back In resting. 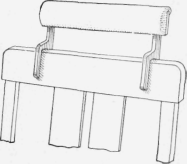 A support for the head Is lacking in the low-back rockers and ordinary chairs. A detachable, padded support can be easily made at home for placing on any low-back chair and used as a head rest. The support standards can be made of wood or metal as desired. If metal is used, the rest will have some springiness, which combined with the pad will insure much greater comfort than the hard rigid back. A cloth or paper is placed over the back of the chair to prevent marring of the varnish or wood.